thaniyans are the invocatory slOkams (verses) that are recited at the beginning of sEvAkAlam at temples, mutts, homes, etc. While each dhivya prabandham has its own invocatory verses, there is a set of common verses which are recited always at the beginning. We will see them now briefly with their meanings. As hailed in “ippuviyil arangEsaRku IdaLiththAn vAzhiyE” (one who lectured the Idu vyAkyAnam to SrI ranganAthan in this world), mANavALa mAmunigaL explained Idu vyAkyAnam – the most glorious commentary for thiruvAimothi to SrI ranganAthan in SrIrangam. On the day of sARRumuRai (completion), SrI ranganAthan himself assumed the form of a small child and appeared in the great assembly. He humbly recited this glorious thaniyan starting with SrISailESa dhayApAthram in front of mAmunigaL. He also ordered that all SrIvaishNavas should recite this thaniyan both in the beginning and ending of dhivya prabandham (which is hailed as thamizh/dhrAvida vEdham) recital, just like praNavam is recited both at the beginning and ending of samskrutha vEdham recital. mANavALa mAmunigaL‘s AchArya thiruvAimozhi piLLai is also known as SrISailanAtha (thirumalai AzhwAr) and SrISailESa. I worship the glorious guru paramparai which starts with Sriman nArAyaNan, has nAthamunigaL and yAmunAchAryar in the middle and ends with SrI rAmAnuja who is my Acharya. I always worship nammAzhwAr along with bhUthaththAzhwAr, poigai AzhwAr, pEyAzhwAr, periyAzhwAr, thirumazhisai AzhwAr, kulasEkara AzhwAr, thiruppANAzhwAr, thoNdaradippodi AzhwAr, thirumangai AzhwAr and emperumAnAr. nammAzhwAr who is hailed as the chief of AzhwArs is glorified by our pUrvAchAryas in some slOkams as the avayavi (whole) and other AzhwArs as his various parts such as head, eyes, etc. 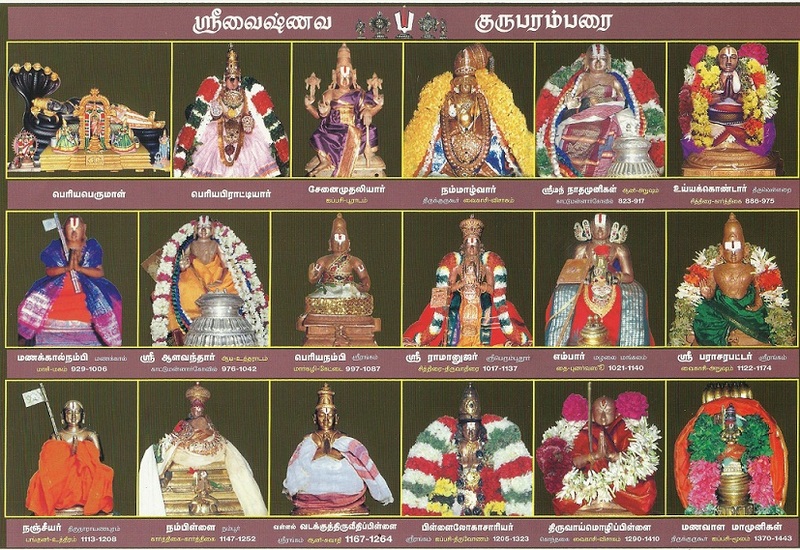 In such slOkams, bhUthaththAzhwAr is highlighted as the head, poigai AzhwAr and pEyAzhwAr are highlighted as the eyes, periyAzhwAr is highlighted as the face, thirumazhisai AzhwAr is highlighted as the neck, kulasEkara perumAL and thiruppAN perumAL are highlighted as hands, thoNdaradippodi AzhwAr is highlighted as the chest, thirumangai AzhwAr is highlighted as the naval and yathirAja (SrI rAmAnuja) is highlighted as the lotus feet. This thaniyan matches such practice of highlighting nammAzhwAr as the whole and the other AzhwArs and emperumAnAr as the parts. Please understand that it is perfectly reconciled that other AzhwArs and emperumAnAr (the parts) are highlighted first and nammAzhwAr (the whole) who is hailed as prapanna jana kUtasthar (the chief among the community of surrendered persons) is highlighted in the end. This slOkam was composed by bhattar on the request of nanjIyar when they were staying in thirukkOshtiyUr. This translation is done based on kAnchIpuram prathivAdhi bhayankaram aNNangarAchAryar swamy’s explanations given in nithyAnusandhAnam book published by Vedics Foundation and Grantha Mala Office (Triplicane). I worship vAnamAmalai jIyar who is like the imprints of mAmunigaL’s lotus feet and who fully depends on mAmunigaL to establish his true nature (as a servant of mAmunigaL), sustenance, activities, etc. ponnadikkAl jIyar (the first sishya of mAmunigaL and the founder of vAnamAmalai/thOthAdhri mutt per the orders of SrI ranganAthan and mAmunigaL) thaniyan is recited In vAnamAmalai dhivya dhEsam, dhivya dhEsams in navathiruppathi area, vAnamAmalai mutts and at the homes of vAnamAmalai mutt sishyas. This thaniyan is recited immediately after SrISailESa dhayApAthram thaniyan usually. This thaniyan is also recited in the thirumALigais (homes of AchArya purushas) such as AththAn thirumALigai (AzhwAr thirunagari), mudhaliyANdAn thirumALigai (appAchiyAraNNA – aNNavilappan descendants), etc., whose first AchArya was a sishya of ponnadikkAl jIyar. I would be grateful if all the information are available in Tamil, the members in the house are able understood the prabandams and start to convey the important matters to the youngsters. Publishing in English only a selective group of people would know the meanings. However your service of publishing in English is useful to me. Thank you for your services rendered to the Vaishnavist.